Keystone arches, multiple gables, and a stately hip roof adorn this stucco traditional, while its split bedroom design combines with an open floor plan for both privacy and togetherness. Columns punctuate the entry, inside and out, and eleven foot ceilings create space in the great room, dining room, kitchen, and screened porch. A rear wall of windows further expands the great room, which features a fireplace with flanking built-ins and a convenient pass-thru to the kitchen. 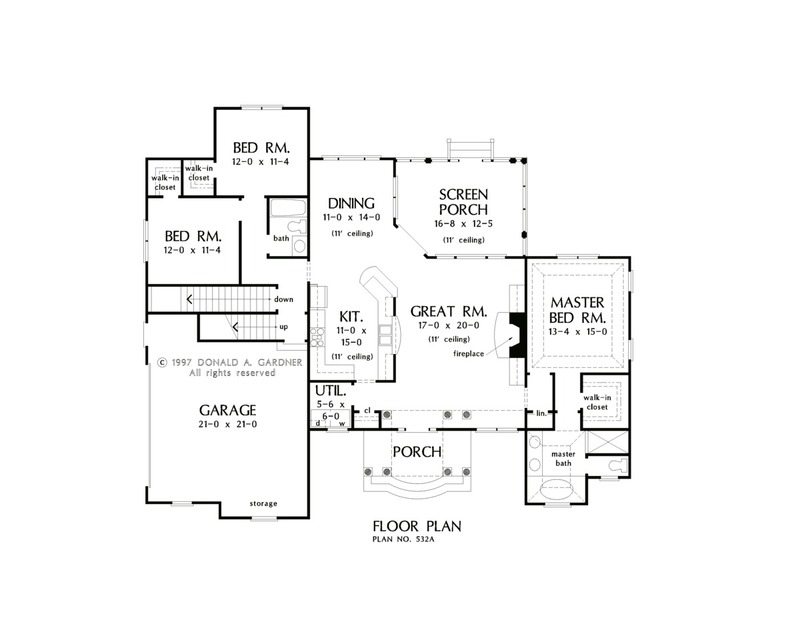 The master suite boasts a tray ceiling in both the bedroom and bath. Walk-in closets are standard in each of the home's three bedrooms, and the bonus room, with access near the two secondary bedrooms, could be finished as a playroom for the kids. 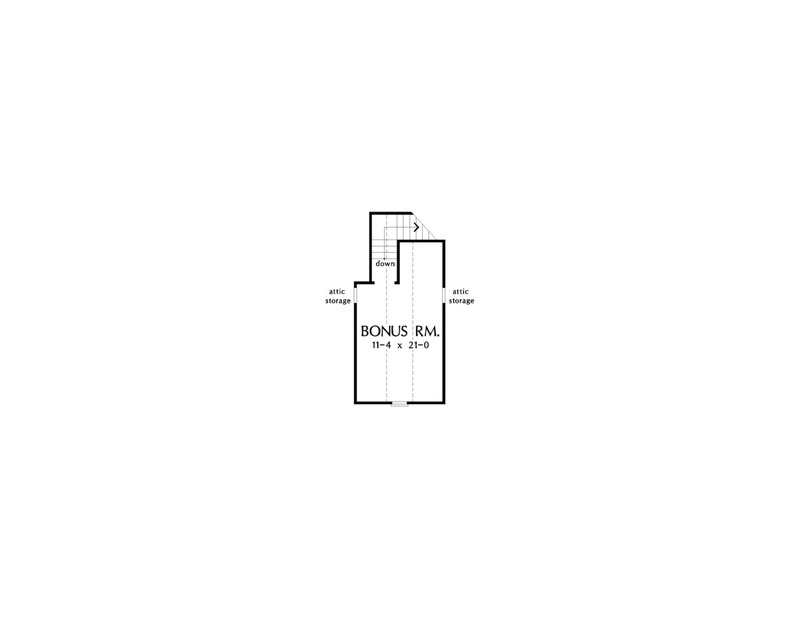 Bonus Room: 229 Sq. Ft.
Porch - Screened: 216 Sq. 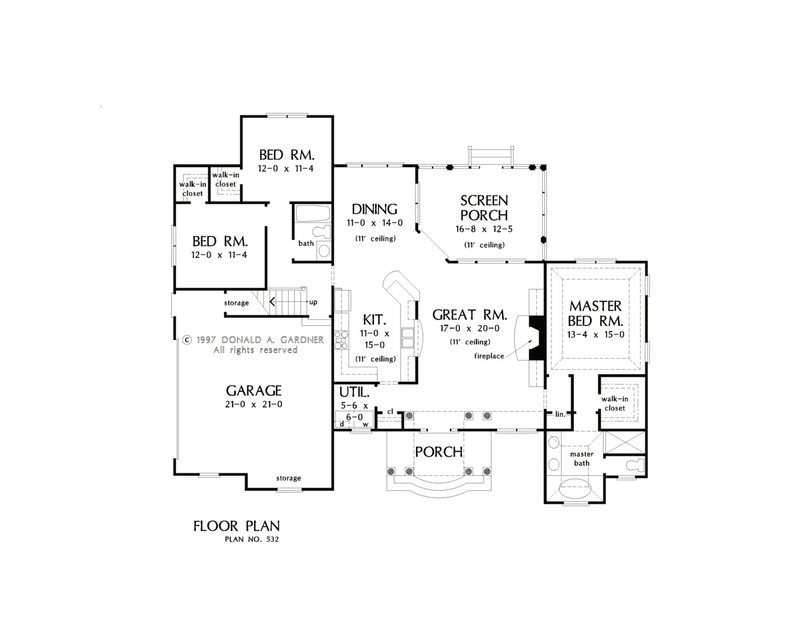 Ft.
House Dimensions: 64' 5" x 52' 11"
Dining Room : 11' 0" x 14' 0" x 11' 4"
Great Room : 17' 0" x 20' 0" x 11' 4"
Kitchen : 11' 0" x 15' 0" x 11' 4"
Utility Room : 5' 6" x 6' 0" x 9' 0"
Bonus Room (Vaulted): 11' 4" x 21' 0" x 9' 0"
Master Bedroom (Tray): 13' 4" x 15' 0" x 11' 2"
Porch - Screen : 16' 8" x 12' 5" x 11' 4"
Storage (Other) : 7' 6" x 3' 4" x 0' 0"